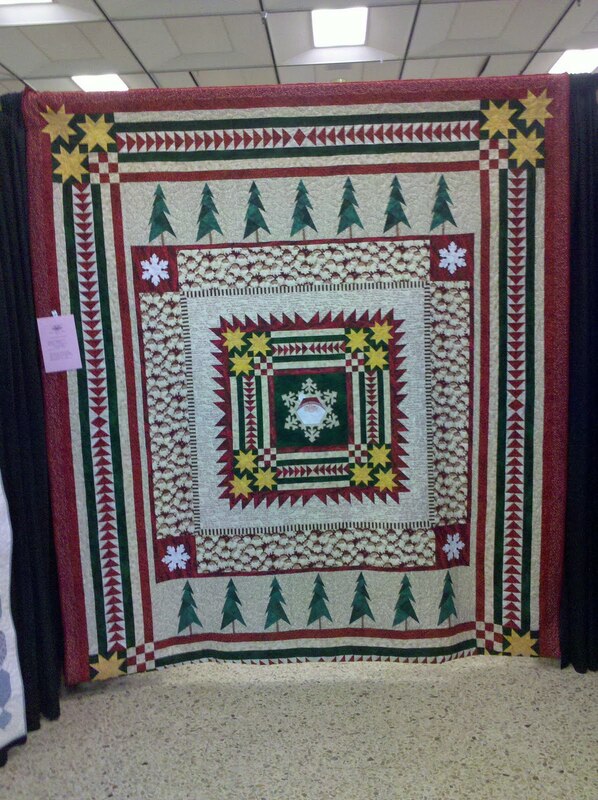 Stacey made this Thimbleberries quilt. It is beautiful! Leisa made this potato pouch for heating potatoes in the microwave. How clever! 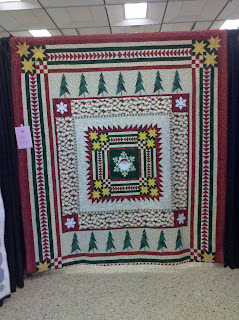 Karen made this beautiful applique block for her quilt guild and a wonderful redwork ornament! Thanks for sharing girls! They're great! In August we had are club meeting at the shop in the morning, but in the afternoon we had the pleasure of having a picnic at Pat's house. What a wonderful day! It was a beautiful day, beautiful gardens and beautiful hospitality from Pat and Arlan and just a beautiful time spent with friends! Here are just a few of the highlights from our day! These striped table runners were all made by Zlaty. She took the extra triangles cut off of the longer runner and made this cute table centerpiece! 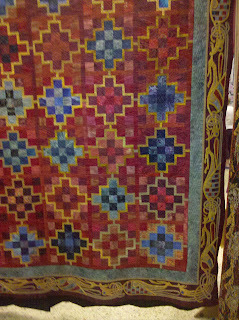 Carol made these two quilts. The lower one had the neatest sparkle to it! Melissa made these two fun quilts! 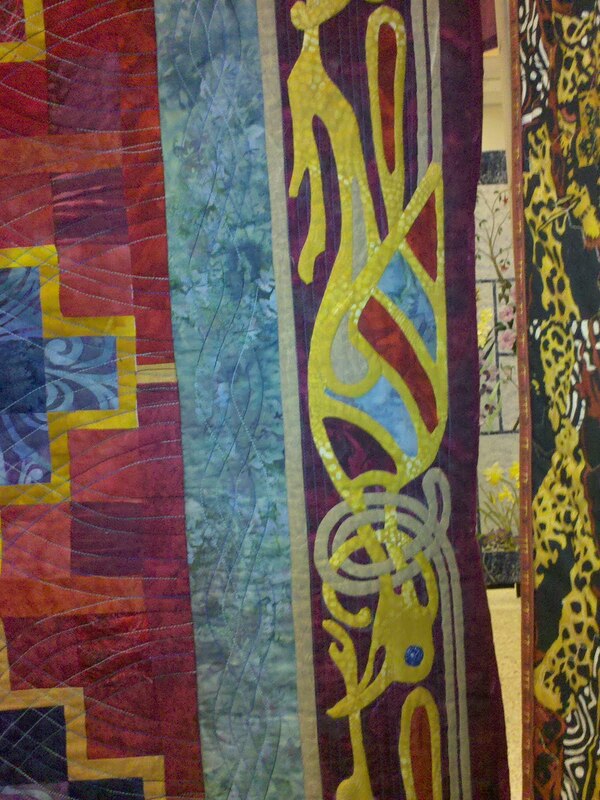 Sue shared a picture of a rag quilt that she made inspired by the fabrics to the right of the picture. What an inspiring day of show & tell! Just beautiful girls! I love all your projects! Thanks for sharing! Below are pics of the beautiful gardens! Thanks Pat and Arlan for a wonderful day! And thanks to all of you for your friendship! We have some new samples in the shop to help inspire you! This is a new pattern designed by my DIL Zlaty called Candy Tablerunner. Isn't it great! It looks just like a piece of candy! I love it. It is so whimsical. This makes up quickly and would look great in your kitchen, dining room or even on a bureau in a kids room! You can see more of Zlaty's quilts here. Zlaty also made this Ashley Bag by Sew Unique Creations and the Brasstown Star by Pacific Pachwork is seen below. The colors are wonderful! The Brasstown Star is a pattern from Paula Stoddard's Block Party Fun! You can join the party for $9.00 a month and receive her pattern and a special newsletter with measurements for a 6" block to use in a sampler, and alphabet block for an alphabet quilt and a smaller quilt project made from the same block of that series! A very fun series! 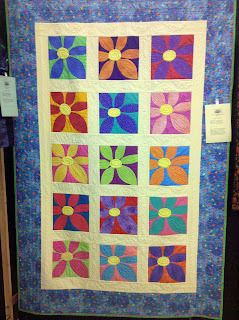 This is Topsy-Twosy by Quilt Queen Designs. 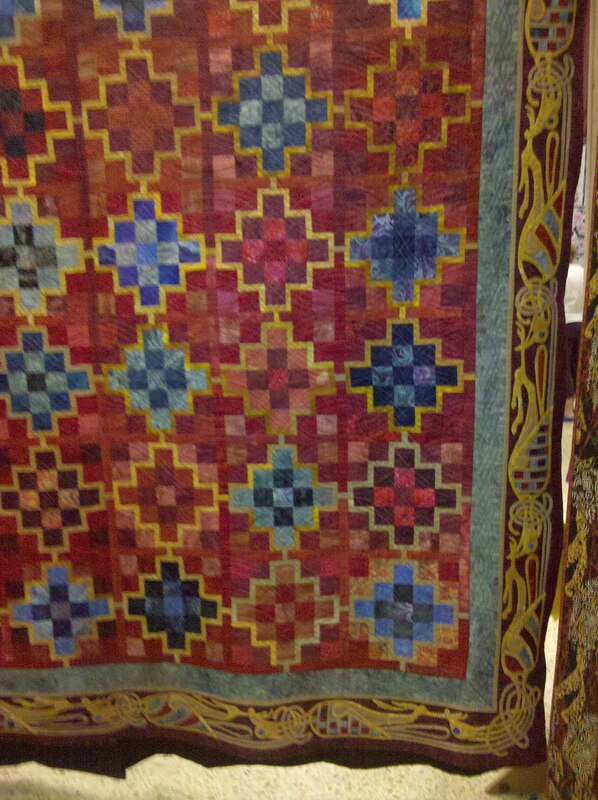 It was constructed by me and quilted by Zlaty. The two quilts are made using the 7 1/2 inch x block ruler. The neat part about this pattern is that the wedges that you cut off of the main block become the block for the second quilt, eliminating hardly any waste. These were fun to do! Three more Christmas Blocks were turned in for the Christmas Surprise Drawing. This one was done by my DIL, Zlaty. 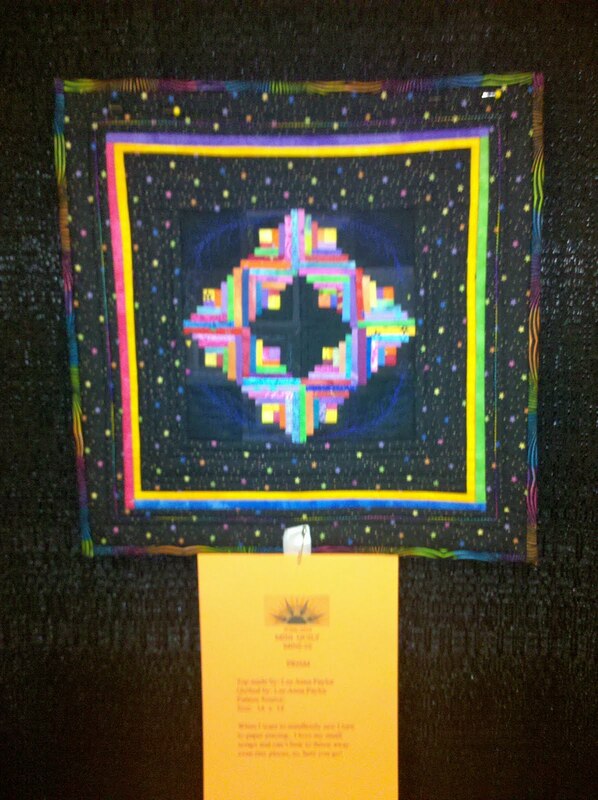 These were done by Melissa and Mary Alice. Aren't they all just wonderful! It's so exciting to see the blocks as they come in. You still have time to pick up your fat eighth and complete your block by Oct. 30, 2010. In June we ventured to Annapolis, MD for a quilt show. It was a lovely show! 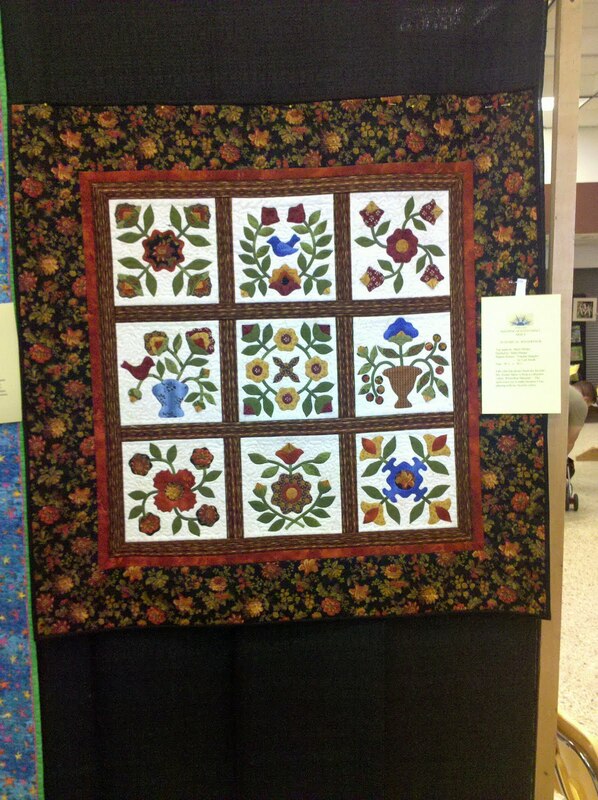 It was the Annapolis Quilt Guild's 28th Annual Quilt Show. They certainly have many talented members there. 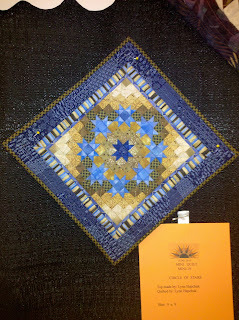 I'd like to show you some of my favorites from the show. 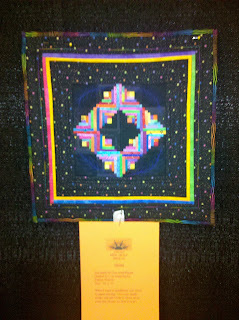 The next two quilts were miniature quilts. It was amazing to see the detail on them. Just look at the closeup of the celtic applique.